I am interested to buy a SKB 130 contoured case because my Bach Artisan case is too heavy and large. My question is: where do you put the rag and the bottle of oil in the SKB 130? there are only a place for the horn and two compartments for mouthpieces. 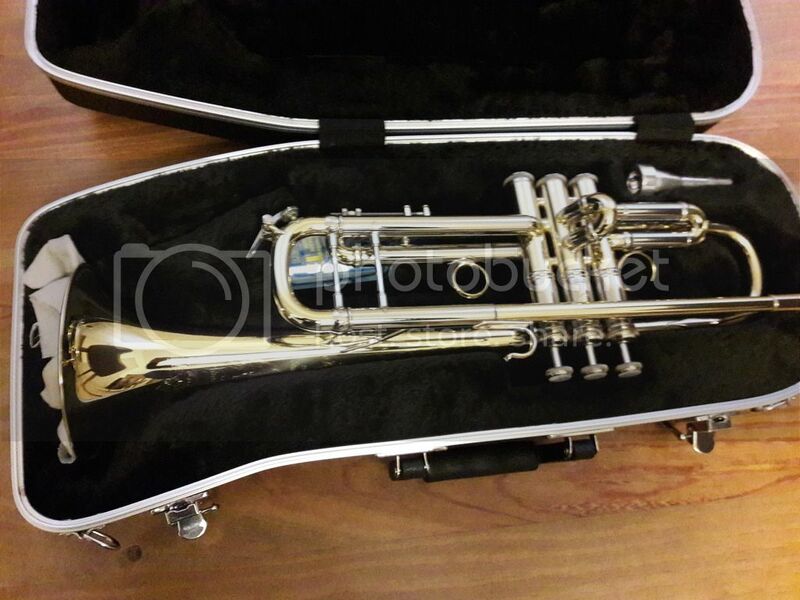 Is the compartment for mouthpiece enough large to put the bottle of oil or the only possibility is between the tubes of the trumpet? This is not what you asked, but you might consider the Torpedo Outlaw; it’s not much larger, probably weighs about the same and with the mute bag has PLENTY of room. Plus it’s very protective. Yeah, costs more, but what did your Artisan cost? 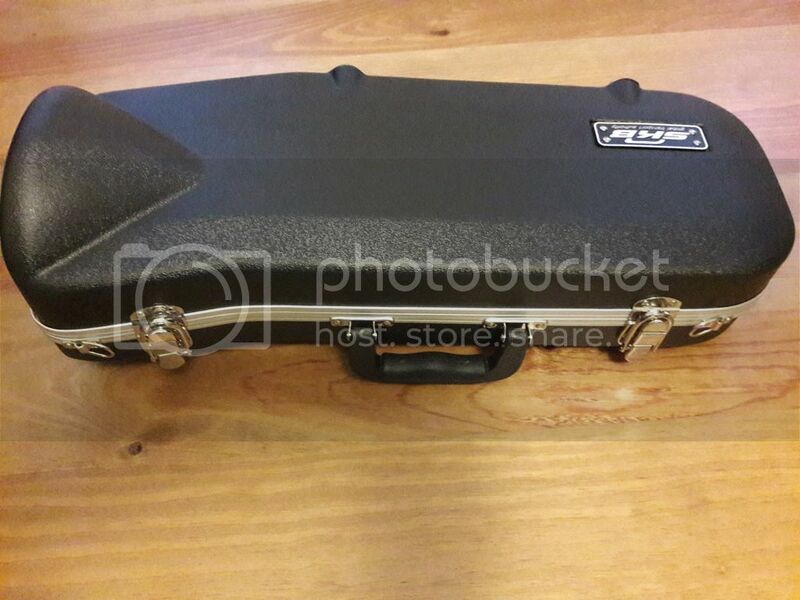 Thank you for your suggestion but i am looking for something cheap (SKB costs 76 euros at Woodbrass; Torpedo costs 235 euros at Thomann), small and pretty sturdy. I will use it when I will not need mutes, when I will play outdoor and to put it with others luggage in the car for holidays. I keep the original Bach case for orchestra when mutes wil be needed. Mine has a slot near the third valve slide where a bottle of oil can fit. A rag can be put into the trumpet between the bell and the leadpipe. Mine went to Africa a few years ago, came back fine. It's not a Torpedo, but it does have its virtues. Al, was that as hold or carry-on baggage? Thanks. Also, does anyone know how these Winter cases holds up? Carry-on. It is a solid case, but I wouldn't trust it below. Just too much rough handling that goes on down there. the skb contoured case is my main case. i have 4 of them!!!!!!! I've seen the single case (the glossy finish one) and it's pretty nice. And while you didn't ask, I've also seen their matching double case. Both seem pretty nice, but I did see an old post regarding the latches opening on the double. My friends that own the single and double have never experienced the problem, FWIW. I think the single case is definitely worthy for in cabin, overhead bin usage. As for under the plane, I'd personally try to find a way to additionally secure the case should the latches pop open. These are definitely as step up from the SKB single. While laid flat, the SKB has a lot of flex/give right around where the second slide is. I have no experience with the carbon fiber model you linked. BTW, I've noticed that this case is started to harder to find. I wonder if other models have replaced it. Quick question, did yours come with the D rings for a strap, or did you add those? I had heard the new ones no longer had the rings. It came with D rings. It is new, I received it yesterday. Would you mind telling us who you bought it from? I’ve considered those, but really don’t want to be drilling holes in a new case to attach rings for a strap. I bought it at Woodbrass in France.